Named after a prominent nearby summit, the Eagle Peak, Mendocino County, AVA consists of steep rugged terrain, high elevations, moderate temperatures, cooling winds, and well-drained mountain soils. It is ideally situated in a climatic transition zone between the cool, wet climate of the Pacific coast and the warm, dry inland valleys of Mendocino County. The new AVA is situated 125 miles north of San Francisco and encompasses nearly 21,000 acres of mountainous terrain. Only 115 acres are currently under vine between Golden, Masút, Linholme, Sea Biscuit South, and Turan Vineyards. 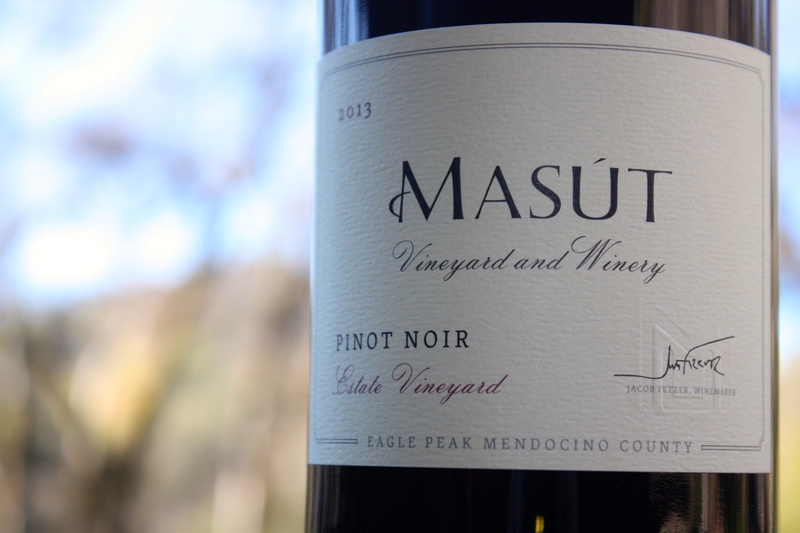 2013 Masut Pinot Noir. The first label to use the new Eagle Peak, Mendocino County AVA on their label. WASHINGTON­—Today, Congressman Jared Huffman (D-San Rafael) applauded the establishment of the new Eagle Peak Mendocino County Viticultural Area in Mendocino County. The Alcohol and Tobacco Tax and Trade Bureau (TTB) designates American viticultural areas (AVAs) to allow vintners to better describe the origin of their wines and to allow consumers to better identify wines they may purchase. The new AVA will take effect on November 10, 2014. As proposed in last week’s Federal Register, the Eagle Peak Mendocino County AVA contains approximately 26,260 acres, of which approximately 120 acres are dedicated to 16 commercially producing vineyards. The AVA lies to the west of both the Redwood Valley AVA and the eastern portion of the V-shaped Mendocino AVA. The Eagle Peak Mendocino County AVA will remain part of the larger North Coast AVA. A map of the proposed AVA may be found HERE. For a wine to be labeled with an AVA name or with a brand name that includes an AVA name, at least 85 percent of the wine must be derived from grapes grown within the area represented by that name. Redwood Valley, Calif.—Mendocino County’s lesser known home for Pinot Noir and other grapes is now part of a new American Viticultural Area. Jake Fetzer, winemaker at Masut Vineyard and Winery, announced that the TTB has approved the new Eagle Peak AVA. Masut is the only winery in the new AVA, which encompasses nearly 21,000 acres of mountains and valleys about 10 miles north of Ukiah, Calif. The name comes from the tallest mountain in the coast range running along the western boundary of the new AVA. Masut may be the only winery, but the new AVA is home to four other growers—Golden Vineyards, Linholme Vineyards, Sea Biscuit South Vineyards and Turan Vineyards—for a total of 115 planted acres. Julie and Joe Golden, who own Golden Vineyards, produce their own wine at custom-crush facilities under the Golden Cellars label. ‘Happy to have it finally done’ Jake Fetzer and his brother Ben Fetzer own Masut winery, which specializes in estate Pinot Noir wines. Masut is located on a 1,500-acre ranch their father Bobby Fetzer purchased in 1992 after the family sold the original Fetzer Vineyards. Fetzer and his sons started planting vineyards on the property in 1997. The new appellation is a continuation of their father’s vision for the property, said Jake Fetzer. “We’re excited. We’re happy to have it finally done.” Bobby Fetzer died in a river-rafting accident in 2006, and Fetzer said he wanted to complete the appellation that he had discussed with his father after planting the vineyards in the late 1990s. He said he reached out to Ralph Carter, who wrote up applications for two of Mendocino County’s other AVAs and has helped with several other AVA applications, and began a process that Fetzer thought would take about three years but ended up lasting longer. “It’s exciting to get it done and add a little distinction to Mendocino County,” he said. Along the way, Fetzer said the application received comments from an attorney representing Concha y Toro, the current owners of Fetzer Vineyards, who claimed an Eagle Peak AVA would conflict with the company’s Eagle Peak Merlot brand, which had originally been produced by the Fetzer family. Jake Fetzer, however, said the issue never became one of serious contention, and the application proceeded through the TTB process. “After that there’s not bad blood, because we sold them a little bit of fruit this year,” he said. The new AVA is in a rugged part of Northern California with little flat terrain and numerous small canyons and valleys. Fetzer said the region’s vineyards are located on hillside vineyards mostly facing east and south and at higher elevations then the nearby Redwood and Potter Valley AVAs. Fetzer said the area is really the transition between the warmer valleys to the south and the much cooler areas that are home to California’s iconic coastal redwood trees. A strong coastal influence provides fog in the morning and nights while the mountainous terrain provides good air drainage that also lessens the risk of frost. The elevation and marine influence create an alternate home for Pinot Noir in the county aside from Anderson Valley where it has gained a very good reputation. Marked by a cooling winds Another unique characteristic of the area are regular winds in the afternoon that moderate high temperatures. “What really defines our AVA are the windy afternoons every day coming through that Big River gap, and they just hum through here,” Fetzer said. While the terrain makes new plantings a challenge, Fetzer said he could definitely see the total number of planted acres growing. “With the size of the AVA and knowing the area pretty well, I don’t see why the AVA down the road couldn’t have 500 acres or more than that,” he said. Unlike the Fetzers’ focus on Pinot Noir, the Goldens’ 2,000-acre Heart Arrow Ranch includes more than 30 acres of mostly Cabernet Sauvignon vines. Julie Golden, who grew up on a vineyard in Mendocino County, said when she and her husband were developing the Heart Arrow property they found the growing degree-days and soil types had more in common with the Rutherford AVA than other nearby Mendocino County AVAs. “We don’t align with the growing parameters in either the Redwood Valley or the Mendocino County AVA,” she said. “So we decided to create our own designation.” The Goldens worked with Bobby Fetzer as well as the Fetzers’ vineyard manager Jerry Yates to develop their properties and view the new appellation as a dream becoming a reality. Yates continues to oversee the vineyard in the Eagle Peak AVA as well as the Goldens’ 25-acre Syrah vineyard at Fairbairn Ranch near Hopland, Calif. All of the Goldens’ vineyards are certified Demeter Biodynamic and organic. At the northern tip of the greater North Coast appellation, Fetzer said the region finally has more of an identity to support the grapes grown there. He said the 2013 vintage of Masut would be the first of his wines to bear the new AVA on the label.